Add first 5 ingredients to a deep casserole dish. Stir until cheese, onions and mayo are thoroughly mixed. Cover with tin foil and bake for 45 minutes or until onions are tender. Uncover and bake for 10 more minutes… allowing cheese to brown around edges. Line cookie sheets with baking paper. (*tip: baking paper helps items cook more evening and aids in the non-stick process). Once onion mixture has cooled, use a teaspoon and scoop spoonfuls into the filo cups. Space filo cups up on tray about 1/2 inch a part. Be careful not to put too close or they will stick together. Once cups are all filled, sprinkle the tops with shredded parmesan. Return to over on top rack and back for 5 minutes until edges turn a golden brown. These tasty little tartlettes are the perfect size to just pop in your mouth and enjoy the melted nutty goodness. I love appetizers and little bites… it allows you to try a plethora of options at the app table or from the “starter” menu. Trois Fromages L’oignon Doux Tartlettes have become quite a party favorite. Last week I showed up with a plate full to an after church get-together… it was a mere 20 feet from the door to the table… but the plate was almost empty by the time I set it down. 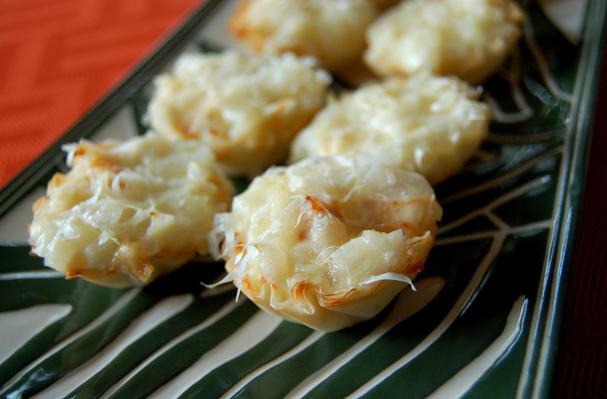 Better known as “those cheesy onion thingys” among my friends… they are simply three cheeses (Gruyere, Swiss, & Parmesan) and finely diced sweet Vidalia onions baked in tiny filo cups. Voila! You are certain to get the “oh my gosh” response from your party guests.